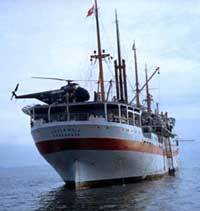 In 1952 Svend Jagd met his wife to be, Tove, on board the hospital ship JUTLANDIA, during its third voyage to Korea. He was Chief engineer and she was a nurse. This is a story about, amongst other things, shabby children, the arbitrariness of the war, about friendship and about Danes who felt they were in Korea to perform a needed task. In this summer (2000) 50 years ago the war in Korea started. Denmark decided to contribute to the war, with a hospital ship. The JUTLANDIA of the Danish shipping company EAC (East Asiatic Company) which was a combined passenger- and cargo freighter, were rebuilt and sent to the coast of the Korean Peninsula. After the rebuilt JUTLANDIA had accommodations for 350 patients. The characteristic white hull with the red cross painted on the side, has several times been printed in Danish history books. No one has ever since been able to put a finger on the humanitarian mission, which lasted more than two and a half year, with three voyages. The ship departed Langelinie January 23, 1951 and returned home for the third and last time, October 16, 1953. The JUTLANDIA was flying the UN-flag, the Red Cross-flag and the Naval Ensign. 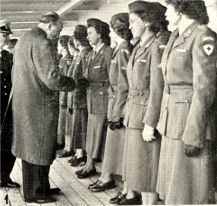 Many of the doctors and nurses received great recognition for their treatment of the injured UN-personnel that participated in the war against North Korea and China. 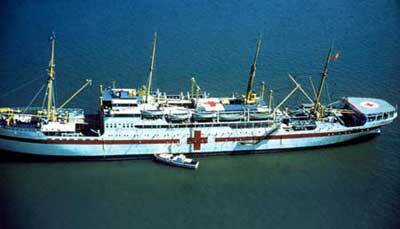 At one time, the 100-man hospital crew, had the opportunity to treat civilian Koreans if the ship had available bunks. Among the crew on the third journey in 1952-53, was the then 27-year old chief engineer, Sven Jagd. On the ship, he met his wife-to-be, Tove Ladebjerg, who was a nurse and the same age as himself. Today, the 75-year old married couple is living in their house on the outskirts of Copenhagen. JUTLANDIA is an inseparable part of their conciseness. A small room in the house is filled with pictures and other items from the hospital ship. The experience of more than one year in the forecourt of Hell has had a great influence on a large part of their later life, and has also marked their view on the human nature. It wasn’t the urge for adventure, that made them sign up for duty onboard JUTLANDIA. It was more an expression of idealism. – I was employed on the EAC-owned MALACA in the start of the 50's, and when the war broke out, we were in Aden, Sven Jagd recalls. – I read in a newsletter, that they were rebuilding JUTLANDIA to a hospital ship. I applied for duty on board, without thinking of the danger in serving on board. But I didn't get to go, on the first journey in 1951. But in September 1952, I received the offer to go. I was at home on leave, when I got the offer from the shipping company. It was three to four days prior to departure, so I got busy arranging the necessary things. – But why the desire to participate in this dangerous assignment? – I had been in the Danish resistance, and gotten off cheap. Millions however had fought for us, and now the Americans were pulling the big load again, this time in Korea. South Korea had – as I saw it and still sees it – been attacked and mutilated. In other words, it was no vacation. It was just like the resistance movement in Denmark a few years earlier, somebody had to do it. There was a meaning and logic in my decision. The motives for Tove, wasn't that of an adventurer either. – When coming from the south of Jutland, you have a special relation to suppression. And in Korea, somebody obviously needed my assistance as a nurse, she says. – It was in the nick of time, that I got to go, because I was one of the youngest. For such an assignment, they rather wanted mature nurses. The average age was around 40, which was properly just, but there was a great interest to come along on the assignment. When they needed 30 nurses for the JUTLANDIA, 200 applied for the job. The payment-procedures on board were very special for the hospital crew. No one could have more than 600 Danish Kroners a month. The rest of the pay was paid to them when they came back to Denmark. The crew of the ship, sailed on the usual agreement between EAC and the Danish Shipping Association. Four nurses lived in each of the former passenger cabins, so privacy was very scares. Even though JUTLANDIA had been rebuilt to an overcrowded field hospital, it was still a elegant ship with its beautiful salons, plenty of mahogany, chandeliers and maritime pictures on the walls. But the ship was already old at that time – from 1934, and it was a tough job to keep the engines running, even if, as Svend remembers, the engines was excellent engines. The two five cylinder diesel engines, manufactured by Burmeister & Wain, gave away 7850 hp, which gave the ship a speed of 15 knots. When it sailed from Copenhagen in 1951, JUTLANDIA was properly the most modern of hospitals. There were several state-of-the-art operating rooms on board, and some of the most famous surgeons of that time was hired – unfortunately only for a couple months at a time. In her own, JUTLANDIA contributed to new chapters in the advancement of medical history. Disposable equipment, artificial kidneys and equipment to transplant kidneys, new kinds of eye surgery, new treatment procedures for burn victims and so on. – As a nurse, one learned to act and work in a new, and completely different manner, Tove Jagd says. – If we received a patient in filthy and bloody clothes, we just cut the clothes of him, and then it was off to the operating table. She remembers vivid when the ship got its own helicopter landing platform. The ship was therefore directed close to the coast - and the front. The wounded soldiers were transported on stretchers, which was mounted on the helicopters fuselage. This lead to that the soldiers could sometimes be on the operating table as fast as 20 minutes after they were injured. Some of them even received a blood transfusion during the transport in the helicopter. At night, the crew could see the lights from the shells, when the fighting went back and forth in land. In this way, they were mobilized and ready to receive wounded personnel, even before they came. In the entire time, when serving as a hospital ship, "only" a dozen patients died on the JUTLANDIA, says Svend and Tove Jagd. It was a grateful job to work with these young wounded soldiers, because they were young and fit, so they recovered pretty fast from their injuries. – I remember a young American soldier, that had been so badly burned by a flamethrower, that we were convinced he wouldn't survive. When I came to his bed the next morning, it was empty, and I thought that he had probably died. But it turned out that he was lying on a stretcher in the cinema with a intravenous needle. He later recovered nicely, Tove says. Svend thinks that the camaraderie that occurred between the soldiers, has helped them through a lot of pain. – They were depending on each other, and they felt that they were fighting for a greater cause. Few people are thinking about, that in the three years of the war in Korea, the casualties was the same as the ten years of fighting in Vietnam. The war in Korea would cost almost three million killed and over three million wounded. Tove and Svend believes, that it has a great effect on the future, not to mention the Korean's understanding of JUTLANDIA, that it as the only hospital ship during the war, also treated civilians. This was a demand from the Danish doctors on board. The captain, Commander Hammerich, went to the joint UN-command, and insisted that, when there was room available, also the civilian casualties should be treated. 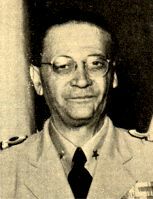 The high command accepted this request, but insisted that the civilians should be transferred to land, if wounded soldiers arrived to the ship. – And we have had to transfer civilians to shore, even if they were far from treated, this was off course not with our good will, and we felt terrible, Tove remembers. – Especially the children was fragile. It was amazing that they were able to survive. Many of them lived like small wild animals. They lived in caves in the earth and in the woods. Their parents were usually killed in the war. The ships nurses were not allowed to go ashore alone, but our doctors and orderlies went ashore to work on the small first aid stations in land. It was on these occasions, they almost stumbled on these shabby children, the children was then sent to the JUTLANDIA, where they were treated. We were a little concerned, that we let them see and feel a world of warmth, light, care, clean clothes and plenty of food. We knew that they had to be sent back to their own world after a couple of weeks. – When we returned to the children after a couple of weeks, the had sold their new clothes and was again wearing their old rags, even if the temperatures dropped below 20 degrees Celsius. – But, what meant the most ?? – Everything really, the Jagd's agree, but the solidarity between the crew was something quite unique. We, who was on this third trip, was very close to the war zone, we were only five miles from the coast. We couldn't leave the ship. On the first two trips with JUTLANDIA, the ship had been in port at Pusan, and they could go ashore. But the best, that Svend and Tove brought back to the Danish everyday, was of course each other. – We had seen each other several times on the voyage to Korea. On new years eve, we were in Pusan. The Americans had invited us to a banquet at a big restaurant, Svend remembers. – I asked Tove if she would be my date, and she did. We had a wonderful evening, and gradually our relation developed. A year and a half later, we were married in Skovshoved Church by the army chaplain from the JUTLANDIA. – We figured that approximately 32 couples, of ships officers and nurses, were married, - and none of them were later divorced. – The reason for this ? Well, we all met during very special and demanding circumstances. We saw each others strong and weak sides. We experienced good times and bad times, and were certainly not spoiled during this peculiar voyage. But we became stronger, seeing the ugly sides of life, that war reveals. After the war in Korea Tove Jagd returned to her former employ-ment, the military hospital in Copen-hagen. Svend Jagd continued as chief engineer in EAC, but only for a year and a half more, before he were hired as superintending engineer for the shipping company. After the return from Korea JUTLANDIA was rebuilt again and returned to active duty as a combined freight and passenger ship. shipping industry. JUTLANDIA was after the return to Denmark, rebuilt again, and returned to active duty as a combined freight and passenger ship. It was finally scrapped in 1965. The article is reproduced here by permission from reporter Peter Jürgensen, Maskinmestrenes Forening.